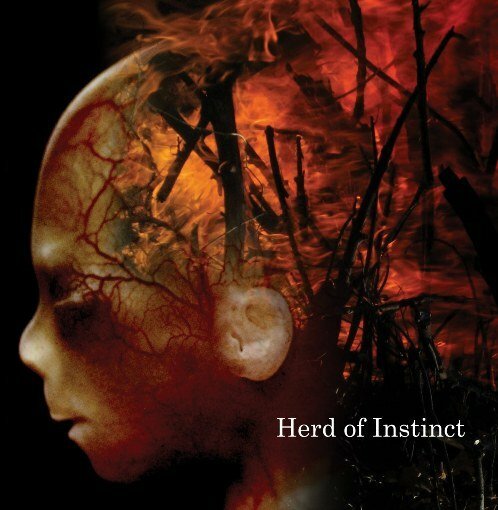 Herd of Instinct is a new instrumental Texas based trio featuring multi-instrumentalist Mark Cook (mainly Warr guitar and keyboards) and drummer Jason Spradlin – both ex-members of 99 Names of God – joined by second guitarst Mike Davidson, also covering bass, guitar synth, and sitar. Their sound is busy and experimental, definitely leaning more in the Crimsoid direction, but we're talking plenty of original ideas blended into this potent mix. The second cut, "Room without Shadows," delivers the primal punch that defines the aggressive side of the trio's sound. Beginning with the third cut, the guest list starts growing, first flute and additional percussion join guest Warr guitarist Dave Street, and the style begins to shift and diversify. With "Blood Sky," Gayle Ellett of Djam Karet joins in on Mellotron and guitar along with drummer Jerry Marotta, while Spradlin concentrates on tuned percussion and singer Kris Swenson turns in the only vocal performance on the entire disc. "Anamnesis" features Street again on bass guitar, plus additional guest spots for second drummer Pat Mastelotto and touch guitarist Markus Reuter, offering further links to the contemporary Crimson sound. Further tracks feature Ellett on bouzouki, keybardist Mike McGary, and second drummer Gavin Harrison. Closer "The Face of Another" has a slightly more acoustic feel that approaches Steve Tibbetts territory. In all, this is a promising new band that hopefully we will be hearing a lot more from.